I) You can upload directly from your computer. II) You can upload via Dropbox. You will have to login to your account on the new window. 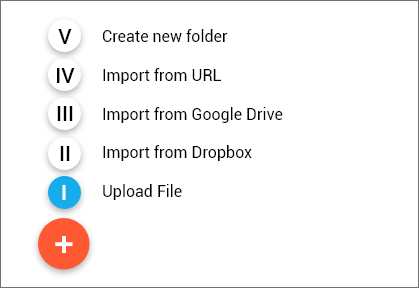 III) You can upload via Google Drive. You will have to login to your account on the new window. IV) You can upload via Link. You will have to enter the URL to the new window. V) Besides uploading, it is useful to create folders to keep and order these content. What are the restrictions about uploading files? You can upload media up to 256MB for now. We are planning to increase the upload limit to minimum 512MB or 1 GB (TBD). All major media formats such as JPEG, PNG, WebP, TIFF, MP4, AVI, 3GP, AAC, FLV and MPEG-2 are supported. If a format you need is not supported and if you run into problems, please let us know. Our system transforms these files into standard codec and creates a new version in lower resolutions for smart signages in order to handle them. With our "Flash Media Transcoder", this process happens just in an instant. At the end, uploaded images are converted into PNG format, while videos are converted into MP4.